Inspired (he says) by this website, Mark Holmstrup, from Albuquerque NM, made this N-scale layout last Christmas with help from his two children (aged 7 and 2). The tiny layout measures 8.5×7.5 in (22×29 cm), and the minimum radius is 3.5 in (9 cm). Marc Witten, from Caine in Wiltshire, England, made his tram pizza with live overhead wire. Track is 16.5mm gauge with a 6 in (15 cm) radius. 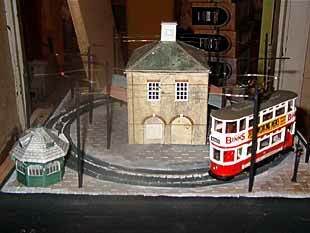 The tram (trolley) car is a converted Corgi model of a classic British “double-decker”. Marc can run two cars independently on the circuit, using a common-return distribution system through the overhead wire. Christopher Creighton, of Schomberg ON, Canada, made this delightful On18 pizza as an exhibition layout. 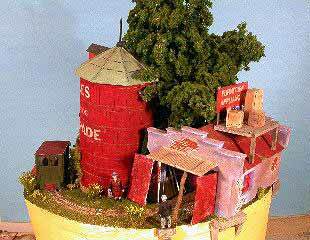 Called Fayle’s Sales in honor of fellow modeller Brian Fayle, this 1/4 in scale layout has a 6-inch-radius circle of 9mm gauge track. It shows off many of the delightful resin castings that Christopher makes and sells on his website. From Sweden comes a work-in-progress shot of another On18 pizza layout being built by Roger S. Jansson, who lives in Frövi, near Stockholm. This one measures 42×42 cm (16×16 in). Roger also operates the full-sized stuff, as head of an industrial narrow-gauge railway museum, the Frövi maskin- och bruksbanemuseum. 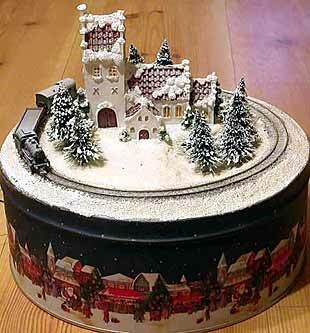 Also from Scandinavia comes this charming Christmas Z-scale layout built on a cake box by Heine Pedersen, who lives in Norway. Radius of the tiny 6.5mm gauge track is about 3.5 in (9 cm). Heine put the whole thing together in an elapsed time of less than 36 hours. For more of this gripping saga, see his website. 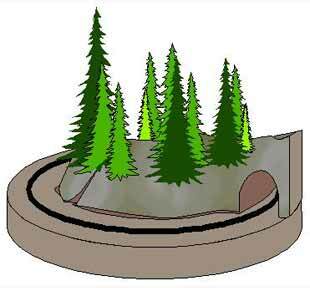 And also from Norway comes this under-construction mountainous pizza layout by Jon Songøygard, who lives in Arendal. Jon’s original design drawing is shown at the left, and a work-in-progress shot is at the right. 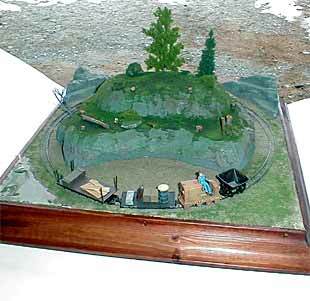 This one is in HOe scale (HO narrow-gauge trains running on 9mm track). Rounding out our wonderful array of pizzas is this Wild West town, inspired perhaps by John Allen or Malcolm Furlow. Victor Smith, from Pasadena CA, is building it in HOn30 on a 9×10 in (23×25 cm) baseboard. 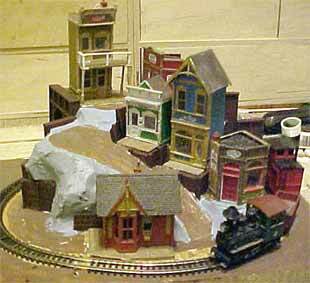 I like the way the town unfolds up the hillside, providing elevation and increased interest to the layout. 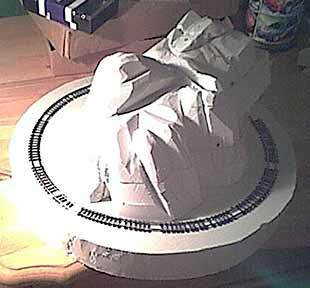 Isn’t it amazing what variety modellers around the world bring to a simple circle of track in a very small area?